Thank goodness the previous owners left their rotary dryer in the back yard! I love using it when the weather is breezy and mild, but my freezing fingers were complaining this morning. I guess this is the difference between being frugal by choice and being frugal by default. PS--the lovely weather lawn ornament pictured above, also from the previous owners but a great deal less useful, will disappear before the house goes on the market. I've always wondered what I would do if the dryer broke! LOL! With twelve children we do have a bit of laundry here! But, living in the northwest means we get a lot of rain, so how do people dry clothes outdoors who live in rainy areas? We have finally had 3 days of no rain after 6 weeks straight of rain everyday! I guess you just have to dry the clothes indoors when in rains. I am SO very THANKFUL for a dryer that works! BTW, the temperature gauge works great in your photo, even if it won't look great for selling the house! LOL! I have an indoor clothesline! It is a wall-mounted 5-Line retractable one. I'm just now starting to really use it. Before I almost always dried socks, underclothes, etc on a drying rack and jeans over the shower rod. Of course there are only two of us- you may need more than one line for that many people! Frugal Homemaker, I've never seen a wall-mounted unit with five lines before! When we lived in an apartment with no laundry, I used a single-line retractable in our bedroom. It had four sunny windows on two walls, which I would open for maximum breeze. Much more efficient than watching clothes spin at the laundromat! Amy Dacyzyn (sp) of Tightwad Gazette fame dried in her attic where she ran clothesline. Heat rises. 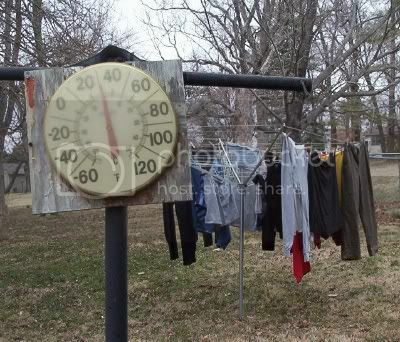 When I lived in a mountain state, we used to hang our wet things outside and they would freeze dry. When you brought them in they would be solid! But as they thawed, they would relax totally dry. Because winter air tends to be dry I find things dry quickly even in our cold basement laundry area. Today I hang wet things on a folding, wooden drying rack...usually hang all knits, elastic-y things. Always use dryer for jeans/towels because I'm impatient and hate them to be crunchy. What memories@ When we lived on a farm in Ohio my Dad attached hooks around the room in unnoticable places and at the end of washday [Monday, of course] he would string a closeline back and forth across the room and we would hang up the days washing before we went upstairs to bed. He'd bank the pot belly stove so it was toasty warm. I remember coming through the clothes when I came down for breakfast the next morning and they were dry. Mama also had a wooden frame with tiny nails [? [all around the edge that she stretched lace curtains on to dry. I got the lovely job of removing them - ouch!